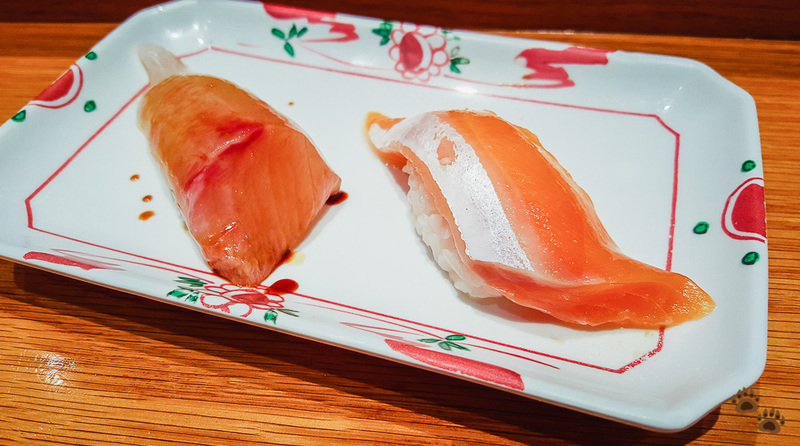 There are many sushi restaurants in San Francisco and the surroundings, however, most of them that we have been to are pretty mediocre. 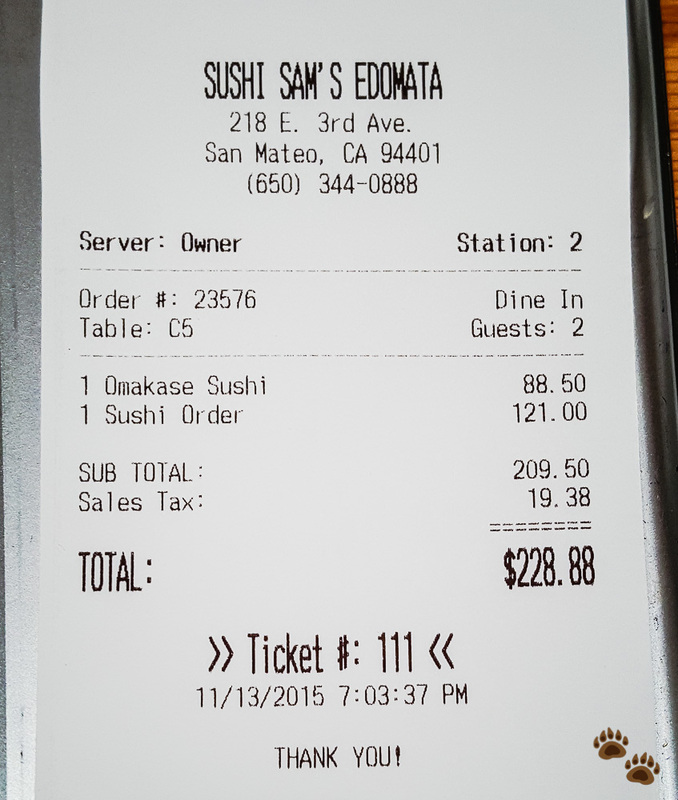 Sushi Sam’s Edomata is our top choice for sushi in South Bay area. Last Friday, the Bears paid a visit to Sushi SAM’s EDOMATA again. We were there around 6 pm and expecting a big crowd considering it was almost prime time on Friday evening. To our surprises, we did not see any line extending out the front door. The restaurant situates on E 3rd Avenue in San Mateo and parking does come at a premium around this time, so PB let MB off first to queue up while he went off to find parking. Well, we celebrated too quickly. There were 5 groups and a bunches of phone reservations ahead of us. We end up waiting for about 45 minutes before the waiter seated us at the sushi bar. 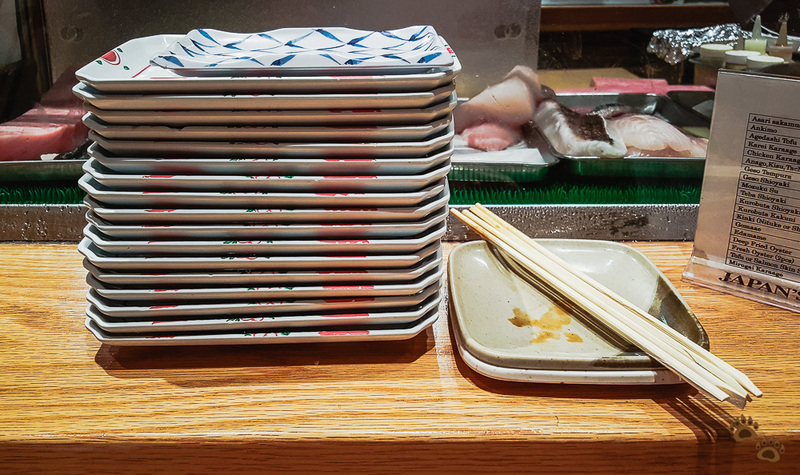 PB started off the order with 16-piece sushi omakase. 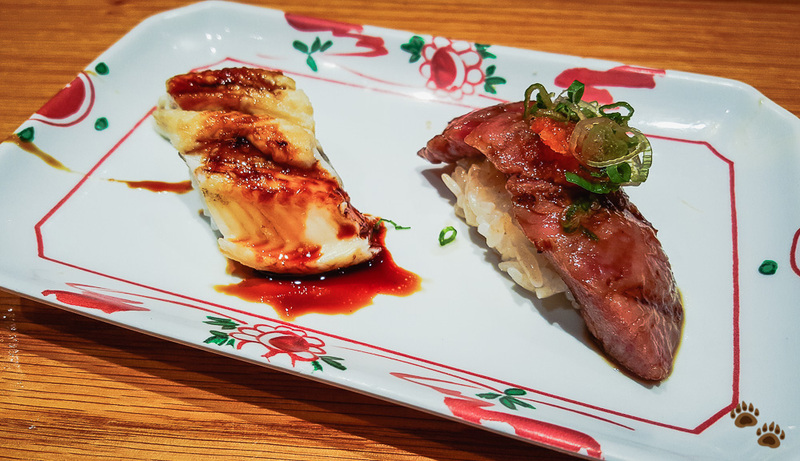 Omakase basically means chef’s selection. 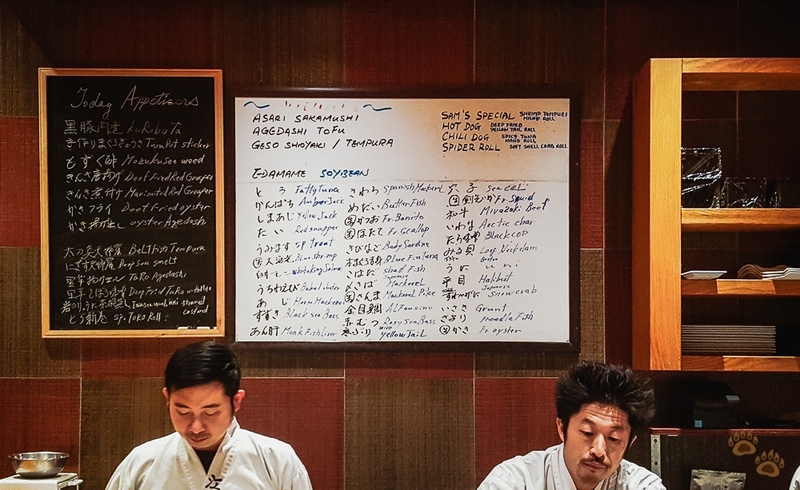 The sushi chef would select the best fish at the time for your menu. MB went ahead with a-la-carte sushi order. Each nigiri order is for 2 pieces. 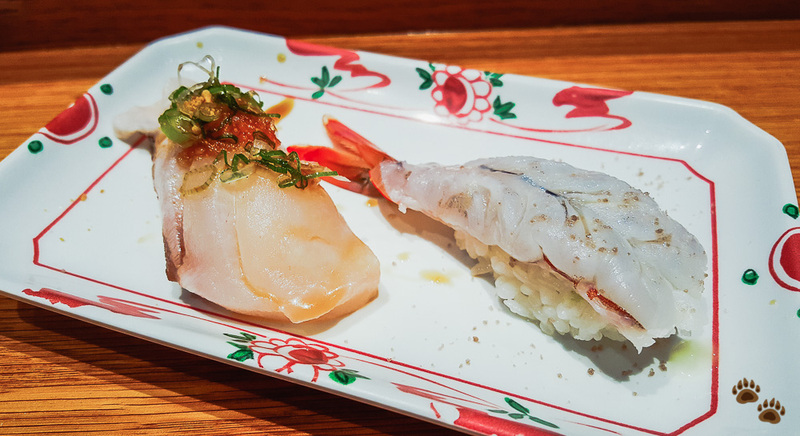 The chef hand-served one plate of nigiri at a time over the sushi bar, with each plate contained two bites. 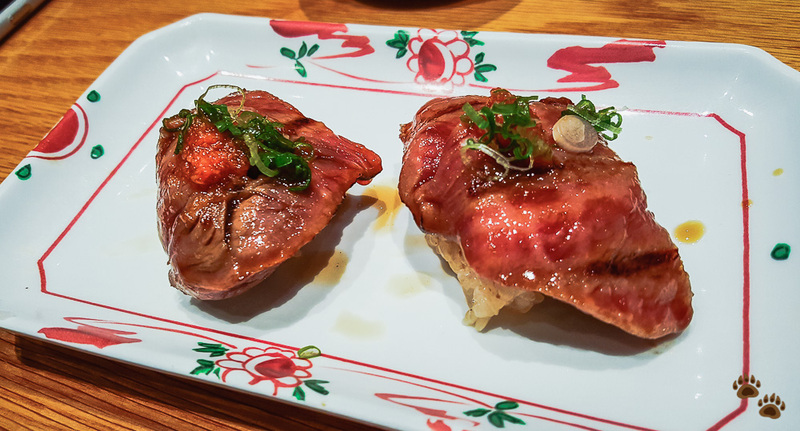 We will post mostly photos from the omakase menu since the a-la-carte items mostly end up in omakase menu anyhow. 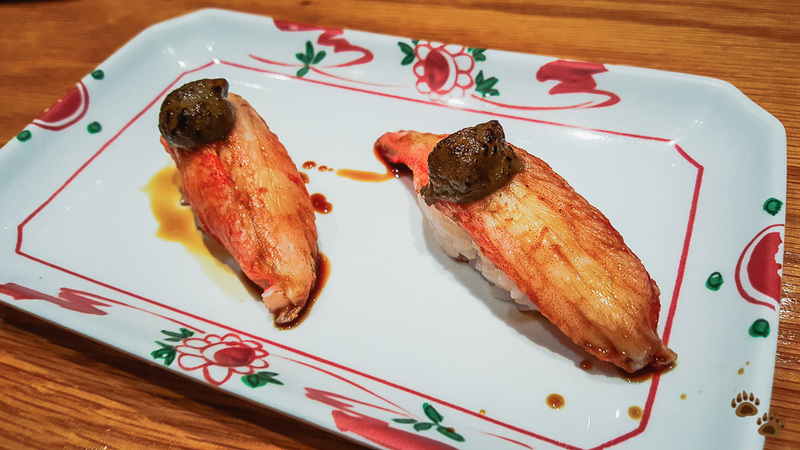 Unlike many of the sushi restaurants in the area, Sushi Sam’s Edomata serves Edo style sushi. The fish typically are prepared beforehand, either marinade or cure. The sushi chef also adds soy sauce, ponzu, lemon, chilli or salt to compliment the texture and taste specific to each type of seafood. 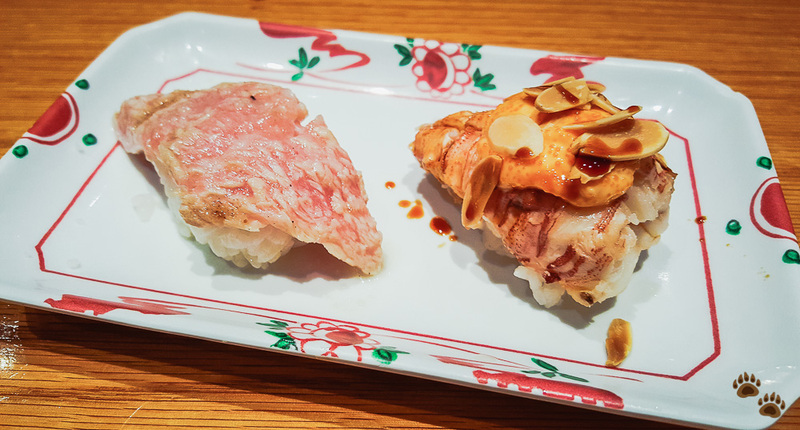 When you eat Edo-style sushi, you can forego the dipping soy sauce. PB’s omakase dinner kicked off with butterfish and blue shrimp nigiri. When we saw the chef handed us the plate, our first impression was ‘whoa… those bites are big!’ The Bears had been to Sushi SAM’s several times, but we did not recall a bite this big before – although it had been about half a year since our last visited. Probably a bit too big but we ain’t complaining 🙂 Sushi purist may say otherwise. The second plate was amberjack and arctic char. PB thought these two bites were a bit heavy on soy sauce made them too salty. Next up on the menu were Spanish mackerel and fresh bonito. 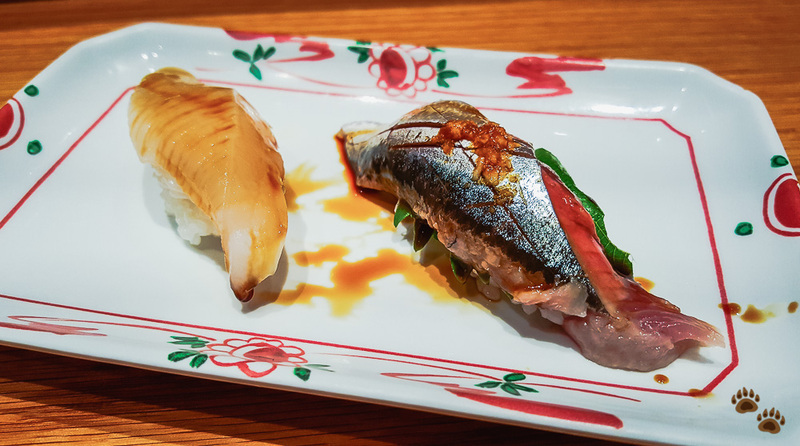 Spanish mackerel was simply melt-in-your-mouth. The bonito was firm and tasty. Yum! Wild bluefin tuna and wild yellowfin were served next. We were now at the half-way mark. Next dish is mirugai or geoduck, accompanied by Pacific saury or mackerel pike. A non-sushi item was next. 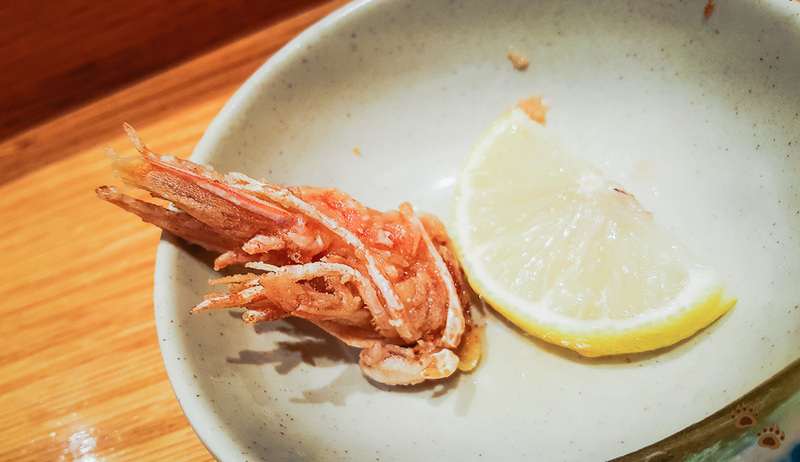 This is the head of blue shrimp that was served earlier in the night. Very crispy and juicy at the same time. This plate was a very rich one. Fatty tuna was another melt-in-your-month covering your palate with full flavour tuna oil. The baby lobster was served with spicy mayo and sliced almond. Here was my most favourite of the night – uni and Alaskan white king salmon. 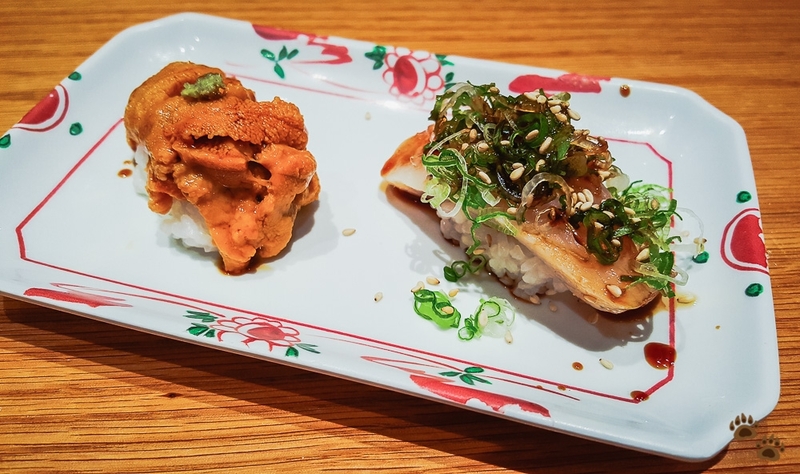 The uni was firm and sweet, and that umami taste of soy sauce mixed with sesame oil and green onion on top of the white salmon piece …. wow!!! Unsurprisingly, the white king salmon was also MB’s most favourite of the night too. 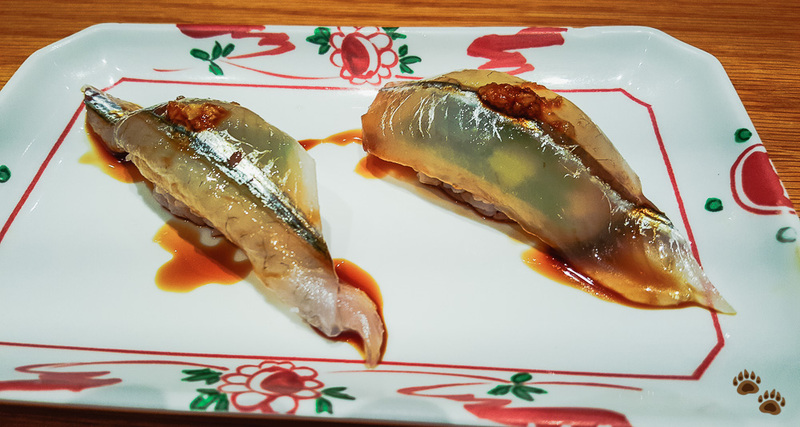 PB finished off omakase dinner with sea eel (anago) and Miyazaki beef nigiri. Miyazaki beef is one of the top rated and most expensive beef you can get in the world, and surely that reputation did not disappoint. The Bears could not help ourselves. We ordered the last plate of the night – Miyazaki beef! Sushi Sam’s Edomata is our go-to sushi in South Bay area when the Bears are craving for good sushi. 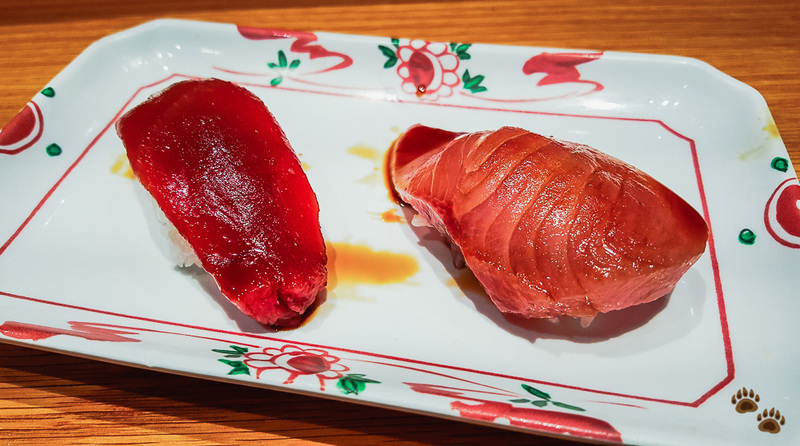 There are many more good sushi joints in San Francisco but that would mean an extra 30 to 60 minutes drive further north for us depending on traffic. The restaurant offers a wide variety of fresh seafood items. Rice was well seasoned, flavourful, and did not fall apart when we ate. 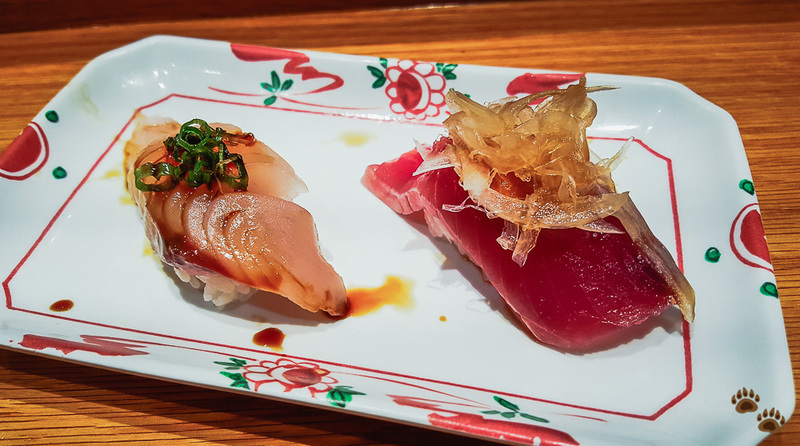 The joint offers excellent sushi and is not too far from our place. Thinking about it, the Bears ended up with 38 pieces or nigiri, equivalent to 19 a-la-cart orders. This averaged out to about $12 an order. It was on the expensive side compared to most sushi restaurants. However giving the varieties of fish available and the freshness, it was well worth the price and visit. And that is our vote for top sushi restaurant in South Bay area.